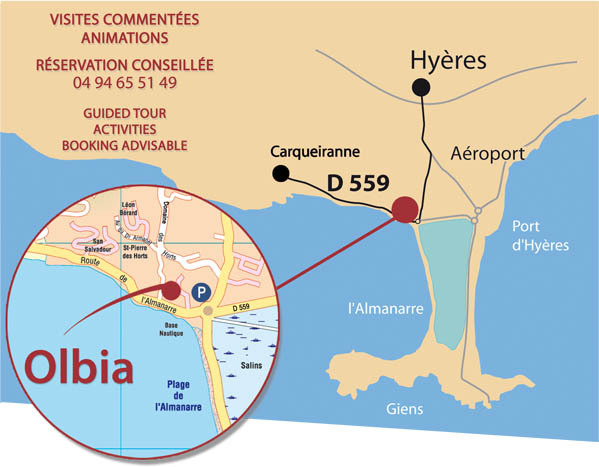 Located on a slight promontory by the sea, Olbia is the only witness, preserved in the entirety of its plan, a network of colonies-fortresses greek, founded by Marseille from the IVth century. BC. Citizens of Marseille, the first Olbians were soldiers-settlers, fishermen, farmers and had as main mission to secure the maritime trade. The excavated remains allow visitors to understand the urban evolution of an ancient city over 1000 years. There are fortifications, streets equipped with sewers and sidewalks, collective wells, blocks of houses, shops, baths, shrines, etc. The remains of a medieval abbey, Saint-Pierre de l'Almanarre, have also been discovered on the site.